Ultimately, it is up to you and your organization to determine how your version of the cloud works. Whether you are migrating to the cloud, managing the cloud, or fine-tuning and optimizing, your success still depends on raising and answering a lot of questions. 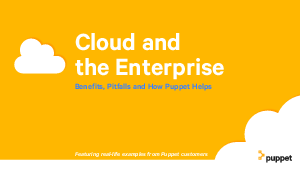 This ebook shows you some real-world stories from Puppet customers using the cloud for development and testing environments, internal private clouds, native cloud applications, and hybrid cloud deployments. We'll explain the benefits to look forward to — like portability, flexibility, saved time and cut costs — and the potential pitfalls to avoid. Download this ebook to learn the pitfalls to avoid, and some real-world successes in the cloud from companies like Wells Fargo, 1-800 Flowers, and HP.